Sister Louise Levesque, O.P. 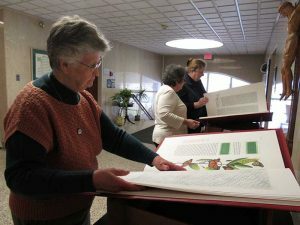 of the Dominican Sisters of Hope examines a volume of the St. John’s Bible on loan at Mariandale Retreat and Conference Center for Holy Week. The Heritage Edition, a two volume fine art reproduction of the original Saint John’s Bible will be on display for guests at Mariandale Retreat and Conference Center on the Easter weekend – and open for viewing to the public on Monday, March 28 from 1:00 to 3:00 pm. The bible is loaned from the Kaplan Family Library and Learning Center at Mt. St Mary’s College in Newburgh. The original St. John’s Bible is the world’s newest hand-scribed and illustrated Bible, believed to be the first such commission since the advent of the printing press more than 500 years ago. It was commissioned by the Benedictine monks at St. John’s Abbey and University in Collegeville, Minnesota. It took a team of international artists, calligraphers and theologians 13 years to complete the 1,165 pages and 160 illustrations, and is estimated to have cost 8 million dollars. The project was headed by Donald Jackson, a calligrapher, artist and official scribe to the British royal family. In their work on the Saint John’s Bible, Jackson and his team used medieval methods and tools: vellum paper, quills fashioned from turkey, swan and goose feathers, as well as paints and inks hand-ground from minerals and stones such as lapis lazuli, malachite, and vermillion as well as 24-karat gold, silver and platinum leaf. The traditional techniques, however, created a Bible for the 21st century, with modern imagery: strands of DNA, magnified viruses and images from the Hubble telescope. It is multi-cultural and multi-ethnic. Jackson had a lifelong wish to create a handwritten bible. He met the Benedictines at St. John’s in 1995 and proposed the project. The artist from Wales and the monastic community from Minnesota came together to create a Bible in the manner of the early Benedictines who, in their scriptoriums, produced and preserved some of the greatest texts of Western Civilization. While the original St. John’s Bible is housed at the Hill Museum & Manuscript Library on the campus of Saint John’s University, Apostle’s editions are housed at the Library of Congress and the Vatican. The Heritage editions were created to bring the inspiring spiritual and artistic experience to religious communities, colleges and libraries around the world. The volumes will be returned to Mt. St. Mary’s College on Tuesday, March 29, 2016 where they will continue to be on display at the Kaplan Family Library and Learning Center. For more information about The Saint John’s Bible please visit www.saintjohnsbible.org. MSMC is a private, co-educational, four-year liberal arts college, located in Newburgh in the mid-Hudson Valley region of New York State. It was founded in 1960 by the Dominican Sisters. The campus overlooks the Hudson River, halfway between New York City andAlbany. More than 2,700 men and women are enrolled in over 50 undergraduate programs and 3 graduate degree programs. The Kaplan Family Library and Learning Center Library opened in 2014 on two floors of the College’s Dominican Center, consolidating research and information services at the Mount. The library provides traditional research resources and services in a high-tech learning environment. There are more than 60 computer workstations in the library, as well as space for group work and quiet study. Librarians help MSMC students master information literacy skills through classroom instruction, individual assistance at the reference desk, and in-depth, one-on-one research consultations. The library offers an extensive collection of books and periodicals, research databases, online journals, e-books, media, and recreational reading. Through its website, students can search for information, ask questions, renew library materials, learn to create bibliographies, and more. Saint John’s is home to Saint John’s Abbey and University, the School of Theology and Seminary and the Preparatory School. Over the years, Saint John’s has become home to a number of other renowned institutions including The Liturgical Press, the Hill Museum & Manuscript Library, the Episcopal House of Prayer, the Institute for Ecumenical and Cultural Research, the Jay Phillips Center for Jewish Christian Learning, Arca Artium, Saint John’s Pottery, Saint John’s Arboretum and Saint John’s Boy Choir. Saint John’s University for men and the College of Saint Benedict for women are partners in liberal arts education, providing students the opportunity to benefit from the distinctions of not one, but two nationally recognized Catholic, Benedictine, residential undergraduate colleges. Together, the college challenge students to live balanced lives of learning, work, leadership and service in a changing world.